The distinctive yellow and black livery applied to the vehicle fleet of the Towens Group of Weston-Super-Mare, Somerset, is a familiar sight on the roads of the West Country as the company is involved in a wide range of operations including plant and tipper hire, civil engineering and other associated activities. 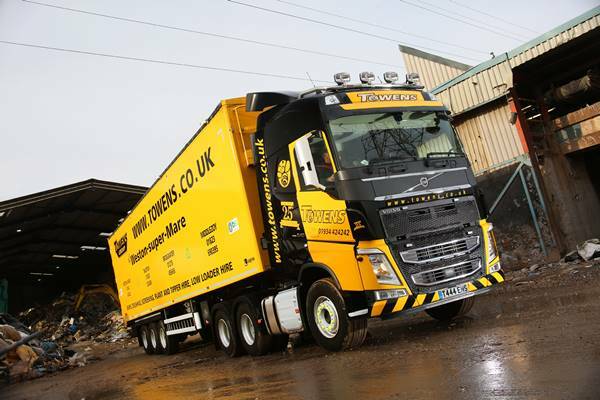 Family-owned Towens Group has recently celebrated its 25th anniversary, which coincided with the delivery of a new Volvo FH-540 6x4 tractor unit that will operate with a large capacity walking floor trailer as part of the waste recycling division. Supplied by Justin Fisher, Sales Director at Stuarts Truck and Bus' Exeter depot, the new arrival sports additional 25th anniversary graphics and is the fourth FH tractor to join the Volvo dominated fleet, which also includes FM/FMX rigid tippers, hook loaders, crane equipped grab trucks and FL skip loaders. Towens Group carefully specified the FH to meet the demands of its daily operations. The D13K 540 BHP engine with Volvo's I-shift automated manual transmission system drive the single reduction axles riding on rear air suspension. This powertrain provides first-rate traction, whilst the spacious Globetrotter cab gives excellent driver comfort. Company Director Nick Towens explains the decision to stay with both Volvo and Stuarts Truck and Bus. "We have used Volvo trucks for many years. They are reliable, popular with our drivers and relatively fuel efficient in what is a fairly tough operation." He adds, "Additionally, the support we get from the dealer is very good, the complete package gives us both piece of mind and low whole life costs. We require 6x4 tractors because the artics have to venture off-road at times, but they still need to be capable of handling long distance work as well. The new FH runs between Swindon and Cornwall, fully-laden in both directions as part of our extensive waste recycling operations." Nick Towens sums up, "Justin Fisher understands our operation. We tell him what we require and he comes back with the right specification vehicle for our needs. Of course we do look at the alternatives from time to time, but see no reason to change at present. We are both family businesses and it is possible to pick up the phone and speak to the people in charge at any time, which is a very important factor."